I have been teaching and playing saxophone and clarinet for over 30 years. I studied at Auckland University School of Music, as well as taking lessons with internationally renowned teachers overseas. I have considerable experience as a musician, playing with the Auckland Philharmonia, Auckland Chamber Orchestra, St Matthews Chamber Orchestra, chamber music groups, recording for Radio New Zealand and recording with rock bands. My teaching experience spans over 30 years and numbers hundreds of pupils of all ages. 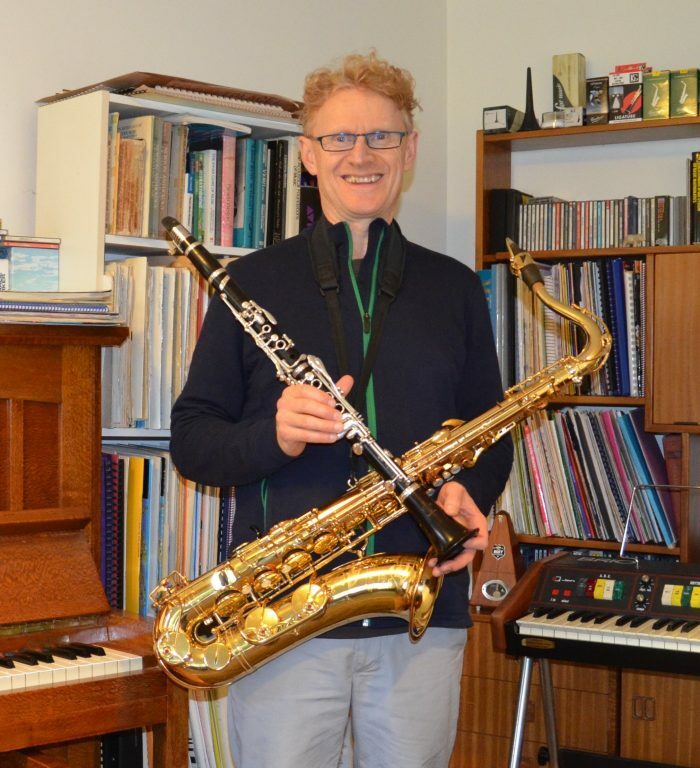 I have also taught clarinet and saxophone in many schools throughout Auckland. I love teaching and helping students develop their abilities and their love of music. I also love helping find high-quality instruments for all levels of players. Once you’ve played a great instrument, you can never go back. If you would like to try a saxophone or clarinet please contact me to make an appointment. I am located in Ponsonby, Auckland’s Central. If you would like to discuss lessons, I would love to help. I look forward to talking to you and helping you on your musical journey. To enrich and inspire through the learning of a musical instrument. My aim is to develop students technical and musical abilities to the highest possible standards and to have as much fun along the way, playing the best music. Most of all, I want to develop my students love of music. The best way to get an idea of my teaching is to hear what my students have to say about me. You can also check out my students on my YouTube channel at………. “Michael Goldwater is my son’s fourth teacher. We travel from Torbay on the North Shore, the traffic is awful but it’s worth it! Michael is an excellent teacher, here’s why.. He gives great feedback and feed forward, you always know your next steps and praise is not lavish but spot on and well earned. He has very high standards of himself in a number of ways including communication, attendance, organisation, provision of music, equipment and instruments. A true professional. At the end of the year he holds a concert for his students to perform for parents, the standard is excellent and many of those who take grades achieve distinctions and achievement is celebrated. I cannot imagine a better teacher than Michael Goldwater. His unique ‘holistic’ approach to teaching, his personally-tailored lessons, and his willingness to try out what the student really wants to do all puts him far above other saxophone teachers I’ve had experience with. I’ve been learning from him for 6 years, and there is absolutely nothing I would change. He’s the best! Michael is a brilliant teacher. Encouraging, fun and engaging, he has brought music to our home and an awareness of what is possible. Thank you for all that you have done for our boy. Who knew he’d love music as much as rugby? Michael is a fantastic teacher. Not only are the lessons great fun, but he is very skilled at improving and fine tuning technique and in doing so enhancing our skill and ability. I would highly recommend him. Quirky, talented and completely committed to extracting the best from you or your child! What more could you ask?To go from standard stuff to playing Bach in just one year has to be commended. Yes, my son played the instrument but (quoting) talent is just ‘silver in the mine’ without education. Thanks Michael for everything. My daughter first met Michael as a clarinet teacher through her school in yr 10, after 3 previous years of lessons and a mixed bag of teachers. She immediately appreciated and responded to his professional approach and the higher standard he expected. When he finished giving lessons through the school we sought him out as a private teacher, and she is still playing 1.and a half years later. What greater recommendation is that; for an adolescent to want to keep playing their instrument & take lessons! Michael has taught our daughter the saxophone for a number of years now bringing her to a level she can now improvise. His lessons provide the ‘just right’ level of challenge and his belief in her ability shines through. As a teacher he is engaging, fun and inspires. If you want to and can commit to lessons. Go for it! You will not be disappointed. Top notch! I’ve been taking saxophone lessons with Michael for seven years and have loved every lesson. I highly recommend becoming a student. My son learns the clarinet from Michael and really enjoys Michael’s sense of humour. The lessons whizz by as the fun and encouraging approach Michael has helps him to cope with beginner’s lip pain! I am a ‘senior’ who loves music and came to the sax pretty late in life. Michael has made learning a pleasure and I never leave a session without a) learning something new and important and b) knowing exactly what to do next. There is a positive sense of constant progress and advancement in both technique and knowledge and yet Michael is always pleasant and relaxed. I am happy to recommend him to anyone. Michael has been teaching my eldest daughter the clarinet for 5 years and our youngest began the sax this year. I have found Michael to be a truly holistic teacher who understands children and works with their moods within the boundaries of a structered lesson. He likes to achieve the most possible out of the half hour lesson. My daughters have fun whilst been encouraged to develop their musical talents and feel pride in their achievements. Highly recommended. Michael taught clarinet to our daughter for no less than 5 years. Michael pitches the lesson at the appropriate level and more importantly has the ability to make the time spent with his student interesting. This in itself gives a sense of worth and the student is keen to return each week for another lesson. In point of fact there simply isn’t we believe a better Tutor who is as highly skilled in clarinet than Michael.We are also convinced that this would also apply to saxophone tutoring also. I first started learning clarinet from Michael whilst at high school and continued as an adult. It’s a great test to Michael’s gifts as a teacher that my originally awful technique was transformed. I now live overseas and my current teacher (a professional musician in London) has been impressed at the way I play – all thanks to Michael. With his broad range of musical and other interests there are always great and worthwhile tangents to lessons which add value to time spent with Michael. Great teacher. Flexible, knowledgeable. Not a frustrated soloist that has to teach to make ends meet but someone who genuinely wants to share his love of music and the instruments. Michael is also very good at tailoring his teaching to a wide spectrum of students. As an adult student I have learned the clarinet with Michael for over 11 years and have enjoyed every moment. His very clear teaching methods and consistent good humour have allowed me to reach a standard of playing and level of understanding I would have thought impossible at the beginning. I decided to take up the clarinet in my mid 60s having previously learnt other instruments. I was lucky to find Michael who really inspired and encouraged me. I always enjoyed my lessons which were stimulating and varied. Now, almost 10 years later, I play in a concert band (which I have done for several years) thanks to Michael’s encouragement and teaching. My daughter has been learning clarinet with Michael for almost a year now, we switched from another teacher, and we are really pleased we did! He is incredibly patient and has a great sense of humour which my daughter really enjoys. He is also really thorough, making sure she is up to date with theory, note reading and knowledge about her instrument. A fabulous teacher! I started with Michael a few years ago as an adult beginner, learning the sax. He is an extremely gifted teacher. He crafts each lesson, using music he knows you will love, and then he takes you one step further than you imagine you are capable of! Every lesson! Highly recommended. John W.
I first started with Michael 11 years ago. He was recommended to me by my school to improve my playing for graded Bursary music performances. He’s just the most incredible teacher. He makes lessons fun & always finds music he knows I like but still challenging enough that I learn something new each lesson. He knows how to get the most of his students and he is such a pleasure to learn from.